The powerful 500 W drill delivers that exact amount of power and support that you would need when you are repairing and completing tasks around the house. It features a compact and lightweight design and can easily be even used when working in tight spaces. The lightweight design makes the drill comfortable to carry and less tiring when you are working. A useful tool that you can use when you have to fix a chair or repair a painting frame. One side can be used to drive the nails into wood surfaces while the claw end can be used to lever the nails out. These bits are the answer to all your rotary related repairs and DIY projects needs. They can be used to screw and unscrew nails and plugs into and from any surface. Be it fixing the leaky faucet or tightening the sink pipe, this adjustable wrench will get the job done. It is a spanner with an adjustable jaw that is compatible with different sized nuts and bolts. Hang your paintings perfectly using this spirit level. It can be used to see if the surface is leveled or not, making it ideal to be used in DIY masonry and wood work projects. If you are working with metal, then these drill bits are perfect for drilling holes and getting the work done quickly. Instead of having to rely on crude methods to cut through items, you can use this multi-purpose utility knife that can help you in any cutting-related work. Hammering a nail into a wall can crack the wall. Instead you can use these drill bits to drill neat holes into concrete walls so that you can fit a wall fixture, clock or a painting. These are specially designed for wood-related works and come in handy when you are working on DIY wood projects such as a new chair for the law or a crib for the baby. You can use this to tighten or loosen nuts when you are setting up your TV stand, night stand or coffee table. You can use this multi-purpose plier for a variety of tasks such as twisting, bending and cutting wires and cables. This tool can come in handy when you are working on electrical projects and repairs. These are of different usages and sizes and can be mainly used along with your drilling work and projects. With this holder in hand, you can easily change the bits, thanks to its magnetic tip. It fits all standard bit sizes and ensures a strong magnetic lock that prevents from the bits from falling off while you are working. Another handy tool that comes useful when you are working on DIY projects that require accurate measurements. This tape can be used to find the right dimensions in a very simple and easy way. You can easily insert and remove drill bits using this key chuck. Having this tool nearby is helpful as you can switch between different drill bits when you are working with different surfaces. This functional drill comes with a host of features and options that make it quite easy to work with. You can use this mode to easily and quickly shift between clockwise and anticlockwise drilling depending on your repair/work requirements. The forward mode can be used to drill into the surface while the reverse mode can be used to drill out of the same surface. This mode can be activated using the switch found at the bottom centre of the drill. You can easily manage the size of the pilot hole that you are intending to drill into a surface using the efficient electronic control technology. It ensures that the drill is fully guided with precision and exactness while drilling, so as to get your work done in the first go itself. When you are working on projects that require a lot of nails and you can use the drill's forward/reverse function to insert and remove nails, screws and bolts. But with the rotating brush in place, an easy rotary action is delivered, that facilitates an easy switching between the forward and reverse modes while screwdriving. While you are using the continuous drill mode when working on a drilling project, you can ensure a consistent drilling performance by adjusting the speed and locking it to the desired speed. This can be done using the small black switch located on the handle and will help you while you are working on projects that require constant and consistent drilling speed. This drill comes with an ergonomic design that sits comfortably in your hand while you are working. You can use the GSB 10RE to fix door knobs on doors. This drill will allow you to attach new doorknob or repair the existing one so that you can securely close the door. You can easily install a wall-mounted rack to display your showpiece items with the help of the drill. You can use the spirit level to ensure that the holes are on the same level, while the drill can be used to securely fix the showpiece rack in place. This drill can also be used to drill holes to fix security cameras in and around the house. You can use the drill, hammer and other accessories to ensure a secure fit. 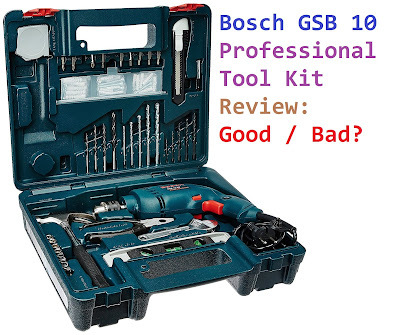 Should You Buy BOSCH GSB 10 RE Kit OR NOT? If you see that in above ratings the product has got an overall (4.3 stars out of 5.0) which is very very Good. Also, if it says hat 1247 people have rated means that around 12000 units have been sold on this website Estimated at X10 (one in ten people used to rate the product), and around 11000 units on flipkart and many on other websites as well. Majority of them have given 4/5 Stars to the product quality and usefullness. 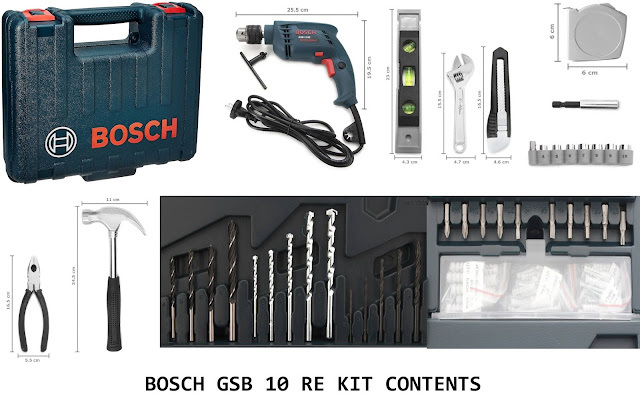 So the BOSCH GSB 10RE product is quite a good selling, perfect for home and useful for all your needs. 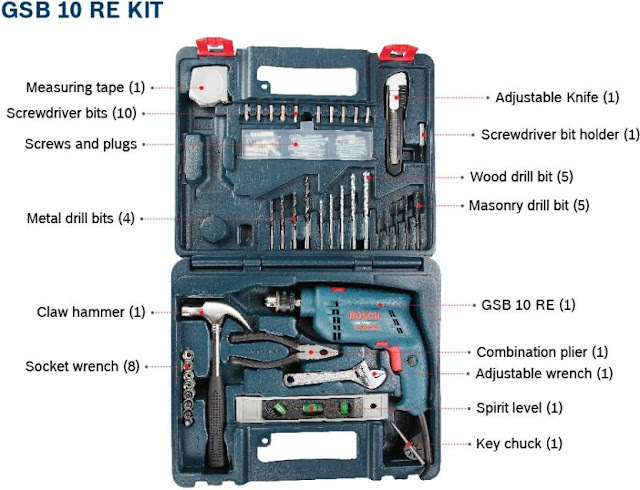 I Definitely Recommend this TOOL KIT to BUY. Here I had provided you with some buying links where you can check out the discounted price of this product.